he loves it a little too much? Edit: I wrote this post prior to Billy's hand injury in the first inning of tonight's game. I thought about not publishing it, but early word is that it will only keep him out a few days. Therefore, I figured I'd go ahead and post it. We've seen amazing things happen when he's on the bases. When he's successful, Hamilton's speed can unquestionably transform innings. But we've also seen scenarios this year where Billy has either gotten on base to lead off an inning, or entered as a pinch runner, and then immediately get thrown out. What had been a promising inning is suddenly cut short before it can even begin. The question with any base-stealer is whether his successes outweigh his failures. One way that we can calculate this is to look at the linear weights values for baserunning. On average, stolen bases have a linear weights value of +0.193 runs. This means that, on average, a stolen base in an inning results in almost 0.2 more runs scored in that inning than in innings in which no stolen base occurred. Billy has 11 stolen bases, so we can estimate that he has contributed 2.1 more runs with his steals than would be expected if he'd stayed on first base (or second base, as if often the case). Each time a runner is caught stealing, however, it essentially kills an inning. You had a runner on base, and now you have an out and no runner on base. The average effect of a runner being caught stealing is to decrease the expected runs scored in an inning by 0.437 runs! Billy has been caught stealing 5 times, so he's cost the Reds an estimated 2.2 runs this season. Overall, this means that Billy's successes on the basepaths has been negated by his failures (+2.1 runs from SB's, but -2.2 runs from CS's). *** You can see these numbers on FanGraphs (albeit with slight differences). Hamilton's wSB is +0.1 runs, indicating, again, that he has basically broken even thus far. ***We could break it down in a more nuanced fashion and take into account the outs and men on base in those innings, but this will be close to these values. I'm also using linear weights that are based on 1974-1990 run environments, not 2013 environments, and so that will also change these values slightly. The message is that Billy arguably needs to get better about picking his spots. Everyone in the ballpark knows that he is running at almost every opportunity. Under that scenario, even Hamilton is going to have a hard time doing any better than breaking even. 1. Perhaps in response to this very issue, Billy just announced that he's going to try to slide head first more often. This is apparently what he has done in the past in the minor leagues. The evidence indicating that head first slides are faster than feet-first slides seems marginal at best. But if he is more comfortable using that approach, it might result in better success rates. Hopefully he is able to find a hand protector that works and prevents a Josh Hamilton-style injury. Protection, if it comes at all, might come from someone in front of him in the order. “The best lineup protection is when Billy Hamilton is on base in front of me, and it’s not about protection, it’s that I get a more predictable pitch to hit — fastball,” Votto said. We’ve seen how it takes a perfect throw home, pop, and throw back to second to catch Billy Hamilton, so we know that the pitcher would rather throw a fast pitch home. And knowing that will help Votto. You can make a very reasonable argument that as long as Billy is breaking even on the basepaths, this form of lineup protection for Joey Votto completely justifies his actions. I'm cool with that. 3. Even if Billy's stolen base game isn't netting the Reds bonus runs on the basepaths (at least not yet), his prowess on the basepaths (going first to third, scoring from third, etc) has generated +1 run thus far. It might seem like a low number given some of his heroics already this season. But the argument is that, some of the time, Hamilton would have scored anyway even if he hadn't taken the extra base. Hall of Famer Barry Larkin was particularly efficient on the basepaths, stealing successfully in 379 of 456 attempts (83%). In 1995, he swiped an absurd 51 out of 56 bases, which was worth 8 runs above average (+41.5 runs via the stolen base during his career!). Man, that guy was good! What caused increased use of term "sabermetrics"? Is Todd Frazier Seeing More Pitches? 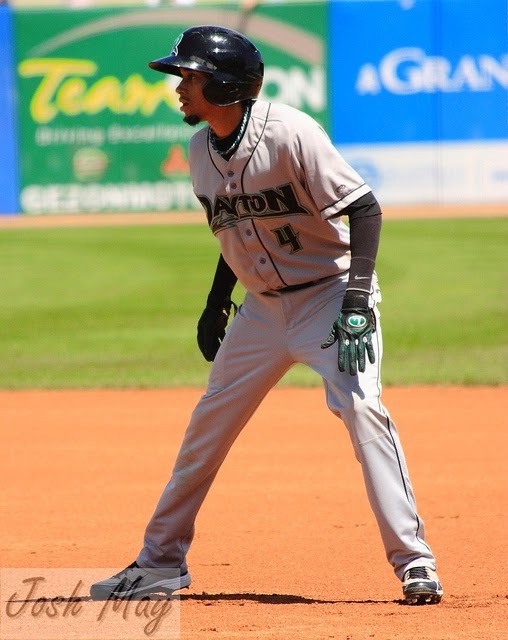 Should Billy Hamilton swing less? Do fast runners protect hitters behind them? MLB to Podcasters: Stop Talking About Our Sport!